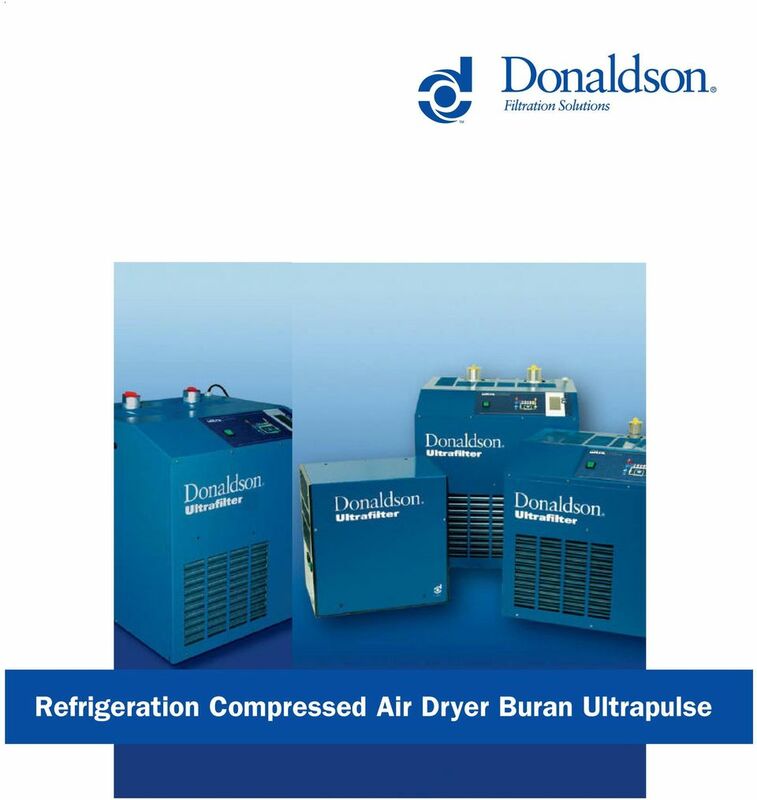 Download "Refrigeration Compressed Air Dryer Buran Ultrapulse"
4 Ultrapulse: State of the art in fridge dryer regulation This microprocessor-based control device is the heart of this generation of fridge dryers. 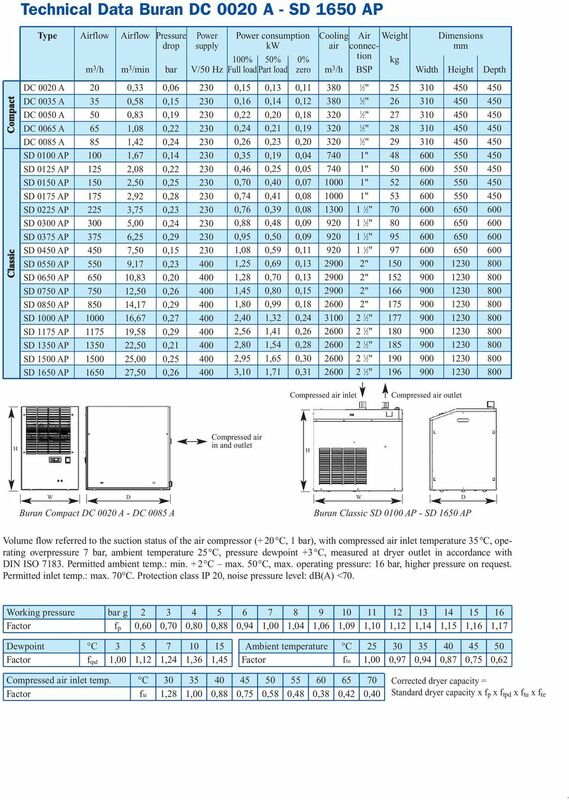 By monitoring parameters such as cooling temperature, pressure in the fridge circuit as well as dryer specific parameters, the actual operational condition of the dryer is calculated. If indicated by the measured data, the fridge compressor will be shut off for a pre-calculated period. 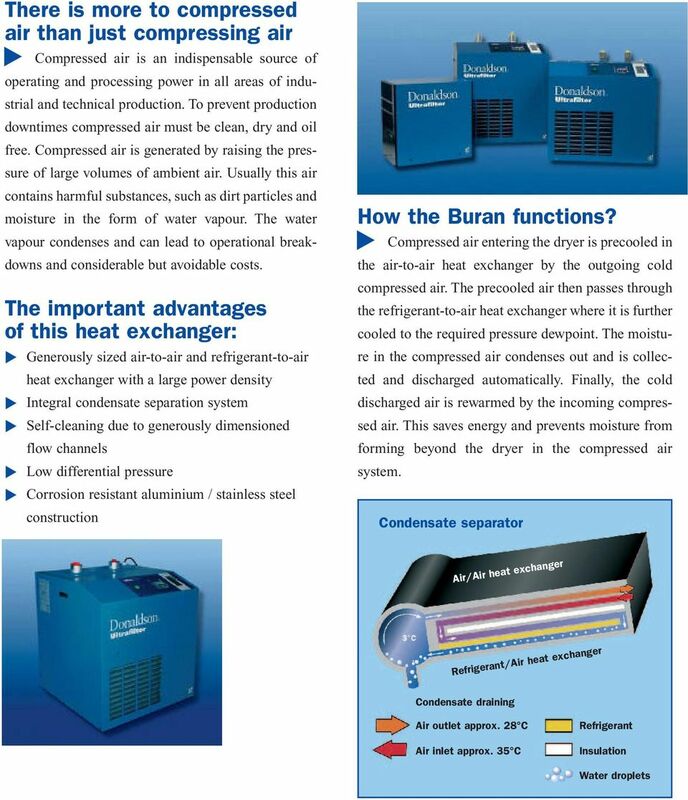 The pulsating measuring of the temperature (several times per second) and the use of the aluminium heat exchanger as a storage mass ensures a quick response to load changes without risking dewpoint spikes above the set level. 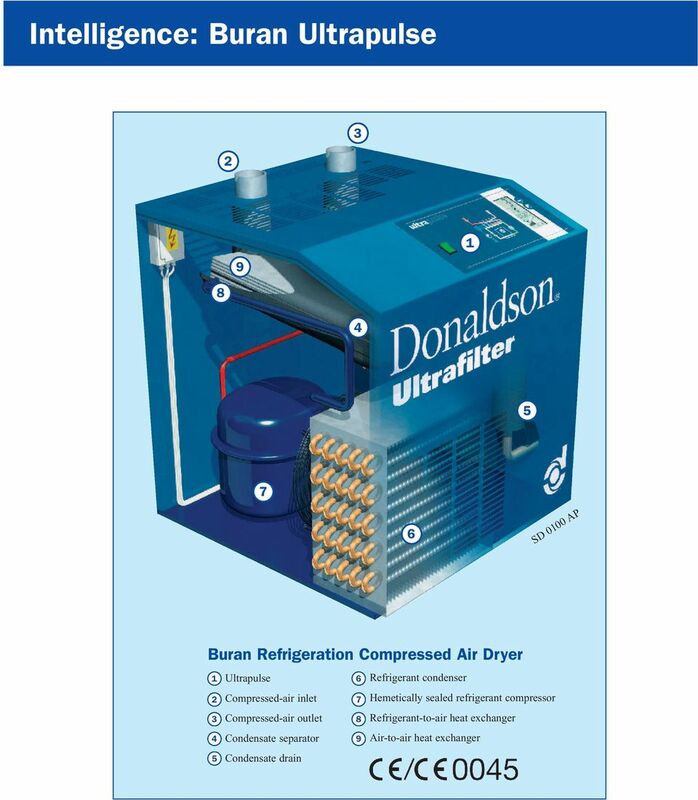 In addition, the processor controls monitors the condensate drain which works without loss of compressed air. 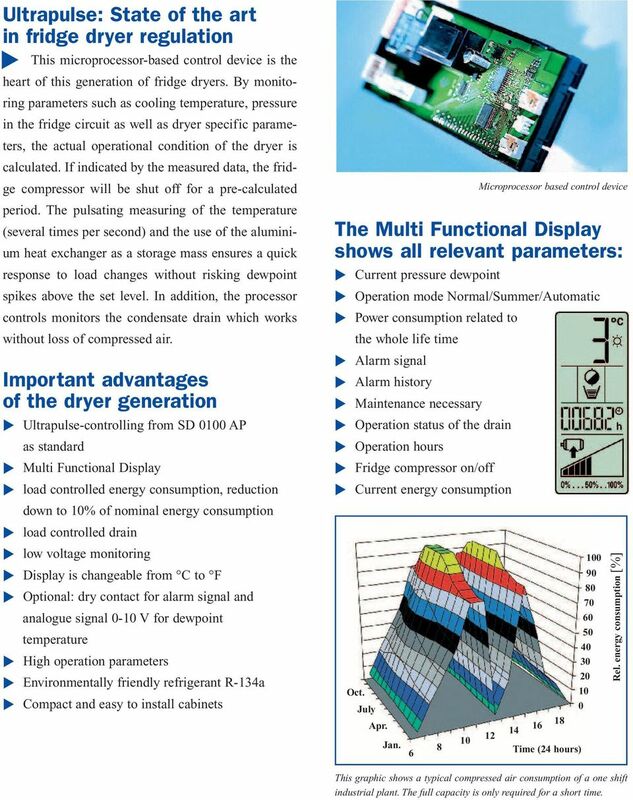 Important advantages of the dryer generation Ultrapulse-controlling from SD 000 AP as standard Multi Functional Display load controlled energy consumption, reduction down to 0% of nominal energy consumption load controlled drain low voltage monitoring Display is changeable from C to F Optional: dry contact for alarm signal and analogue signal 0-0 V for dewpoint temperature High operation parameters Environmentally friendly refrigerant R-34a Compact and easy to install cabinets Microprocessor based control device The Multi Functional Display shows all relevant parameters: Current pressure dewpoint Operation mode Normal/Summer/Automatic Power consumption related to the whole life time Alarm signal Alarm history Maintenance necessary Operation status of the drain Operation hours Fridge compressor on/off Current energy consumption Oct. July Apr. Jan Time (24 hours) Rel. energy consumption [%] This graphic shows a typical compressed air consumption of a one shift industrial plant. The full capacity is only required for a short time.